In general there are many fishing methods employed by fisherman in all parts of the world to catch fish, the methods we are familiar with are using handline, rod and reel, netting or traps. But as angler, we'll focus on the rod and reel method and maybe cover a little on the alternative methods. The fact about how well we do when fishing is based on 50% luck (right place right time sort of thing), 30% knowledge (location and fish you're targeting), 20% equipment. But we probably spend 80% of our fishing budget on equipment, don't we? The general excuse is, when a fish eventually get hook up on our rig we have to make sure that our equipment must be good enough to overcome the fish and land it, I guess we all agree on that! So that's why we need 10 rods and 15 reels at home, one for each occasion. 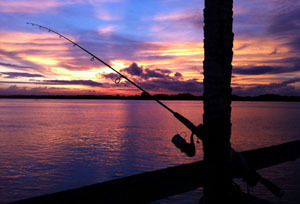 For rod and reel fishing, the essential equipment you'll need are the rod, the reel and the main line. On the end of that, you'll have your terminal tackle like your swivel, leader line, hooks, lure, sinker (weight) or float. For this section we'll have write ups on these items.